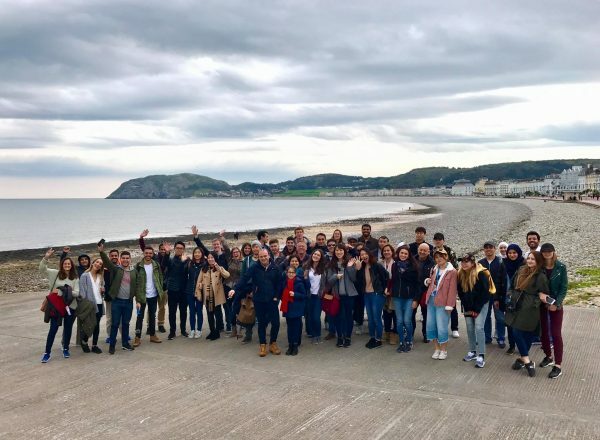 The whole group enjoying Llandudno beach. During the trip we had 4 destinations; Llandudno, Conwy, Snowdonia National Park and Betws Y Coed, I’ll tell you a little bit about all of them. After a trip of about 90 minutes we arrived in Llandudno, a beautiful Victorian seaside town where we were able to walk on the beach and the pier, there are all kinds of nostalgic little shops. Foodie tip: try a Welsh meat pie (only try this if you’re REALLY hungry, because there’s a delicious lunch waiting for you in Conwy). This was our longest stop (two hours), our guide gave us a choice to either visit the old castle, or join him on a walk on the city walls. I chose the walk over the city walls because it was free, yes I am THAT Dutch;), and because I wanted to enjoy the nice weather (no rain Yay!). After that we drove into the national park where we had a short walk amongst the mountains. As I come from the flattest country in the world I was mesmerized by the beauty of the surroundings and how clean the water was. Our last stop was in a little town on the edge of the National Park, this was the perfect ending tot he trip as it combined the friendly town-life with the stunning nature of the park. The town centre had several beautiful buildings such as the train station and St. Mary’s church. If you’re ever stuck trying to decide which trip to join, I advise you to go to North Wales, not only because of how beautiful it is, but also because you’ll be able to cross another country off your UK countries bucket list. If you’re interested in following an English course with EC, why not join one of our IELTS Courses in Manchester?